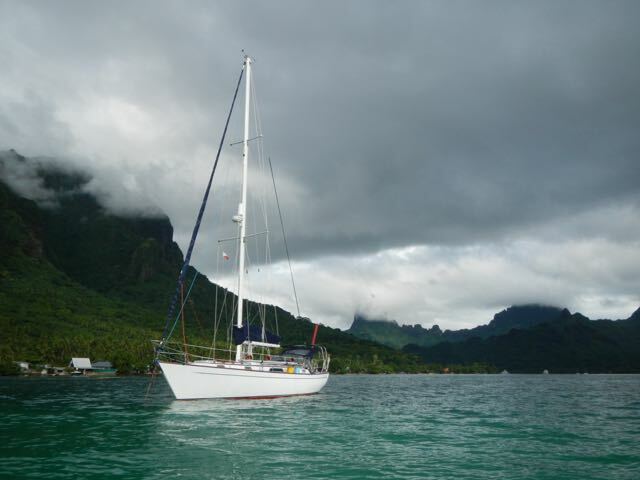 We enjoyed our many days on Huahine, and we had a surprise encounter with some Australian cruising friends that we had met in San Carlos, Mexico in 2012. In the meantime, they had circumnavigated the Pacific, visiting Alaska, then circumnavigated South America, including passing Cape Horn, one of the world's Seven Great Capes. 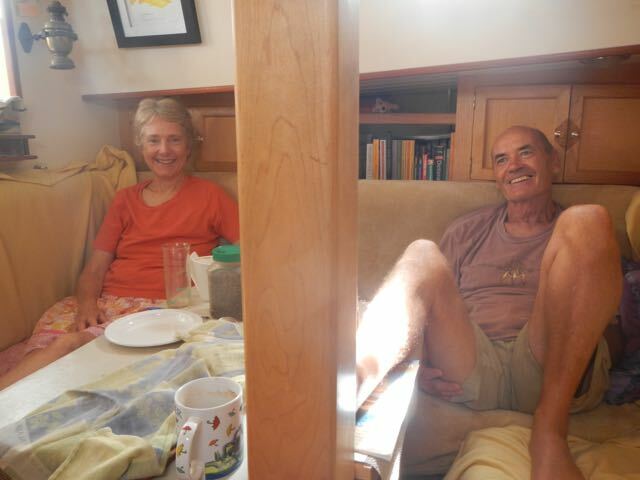 Chris and Margaret live on Storm Bay, a steel-hulled 40-foot sloop. 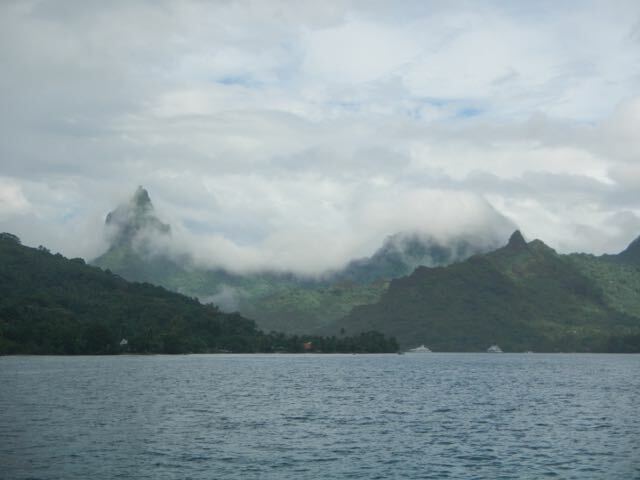 After a lovely brunch aboard Storm Bay, we departed Avea Bay and headed Southeast toward Moorea. Storm Bay is forty-feet, the same as Wings, but has a bit less people space since so much is dedicated to stowage and tankage. For a cruising boat, that's a good trade. This is her cockpit. She's steel, but is controlled via tiller. The winch was on the boat when they bought her and looks like a vintage Barient. Margaret and Chris in their natural habitat. They're as liberal as we are, so we had wonderful conversations. 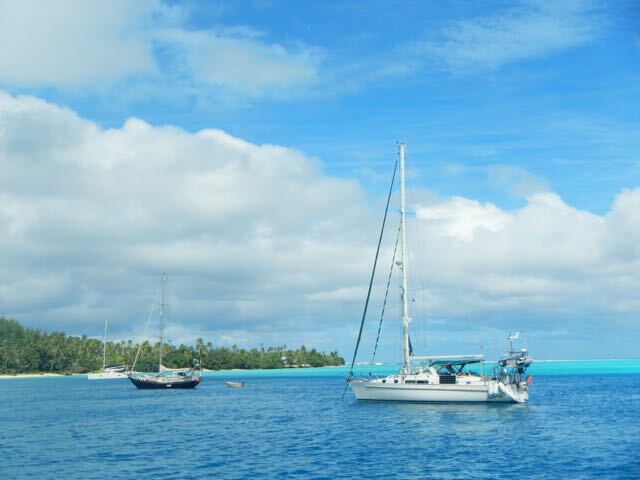 A Conni photo showing the variety of blue color at Avea Bay. The dark-hulled boat is Storm Bay. 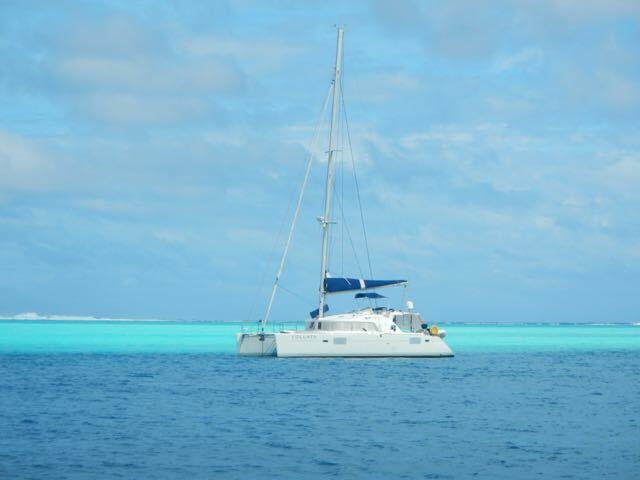 Another Conni-loves-blue photo showing the very shallow beginning of the reef and the deeper water for anchoring. It really was beautiful. We had expected a difficult anchor raising since we had swung on the anchor in sizable winds for several days, but the anchor came up easily. 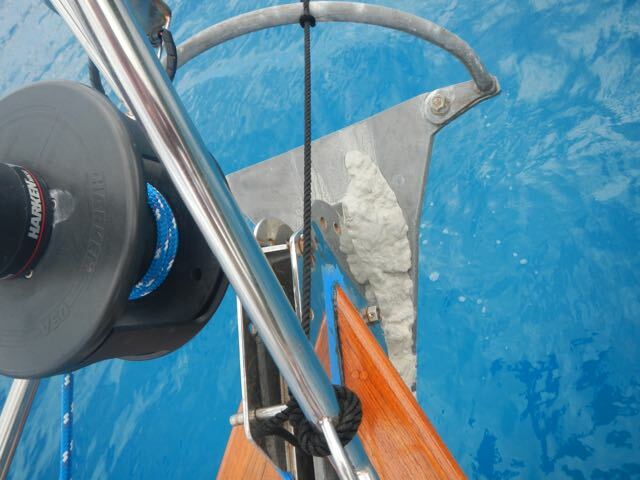 The bottom was flour-fine sand and stuck a hook like crazy: you can see a sample on the anchor. The blue on the bow is blue masking tape that was put on for the varnishing that the crew at the Carenage didn't complete. We had them leave it so that I could use it to complete the task. 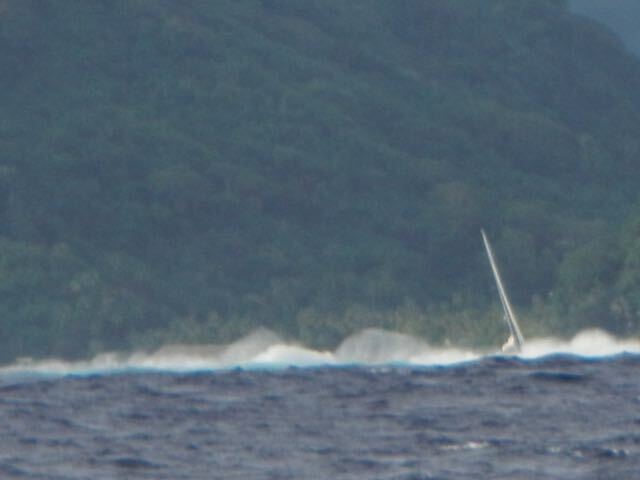 Exocet, the boat that went aground on the Huahine reef a day before our arrival, sits forlornly in the surf. Dominc from the Carenage did try to salvage the boat, but was unable to do so. He'll sink her. Taken as we passed her from inside the reef. 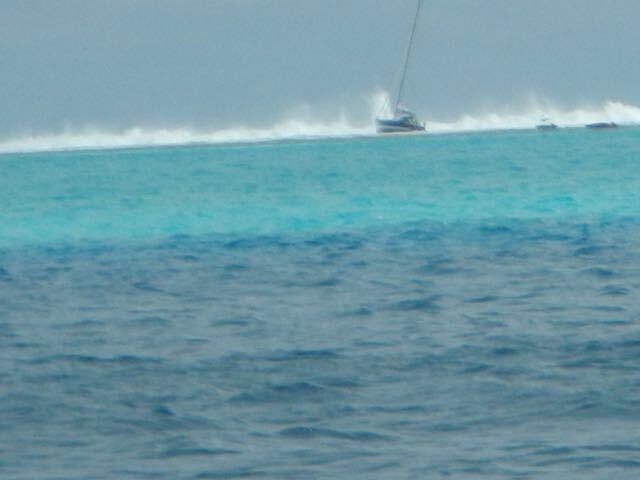 Exocet from outside the reef shows just how dangerous vessel rescue can be. 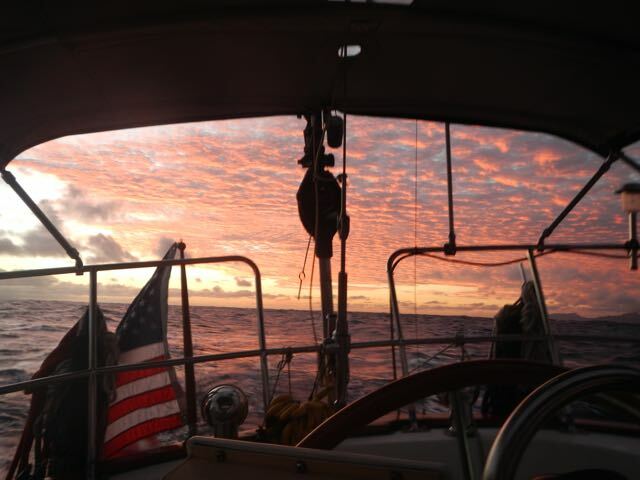 The evening that we departed Huahine, we enjoyed this gorgeous sunset. 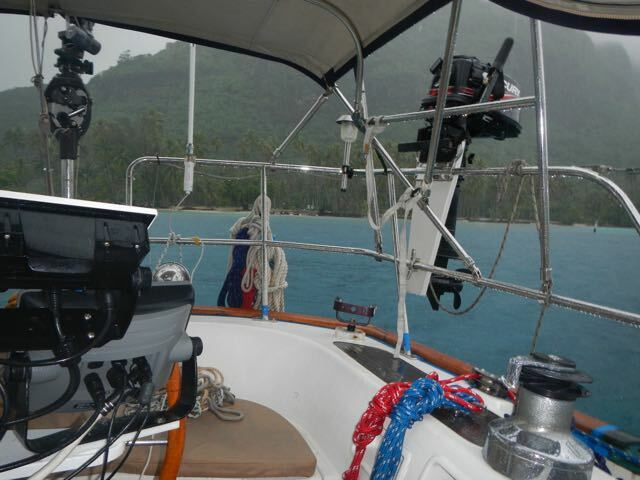 On arrival in Opunohu Bay on Moorea, we snapped this photo of the cockpit. The wonderful Mercury sits on its stand, the instruments, at left, are covered from sun damage, and the odd antenna at the stern is our Wifi enhancer. Even if we can't quite reach a Wifi service with our laptops, this powered system will pull it in. I connect to it via that Ethernet cable and then use my laptop's Wifi to share the signal. The small solar powered rail lights (there's another at the other corner) give us some cockpit light and also make it much easier to find Wings in a crowded anchorage. Opunohu Bay in the rain clouds is still beautiful. 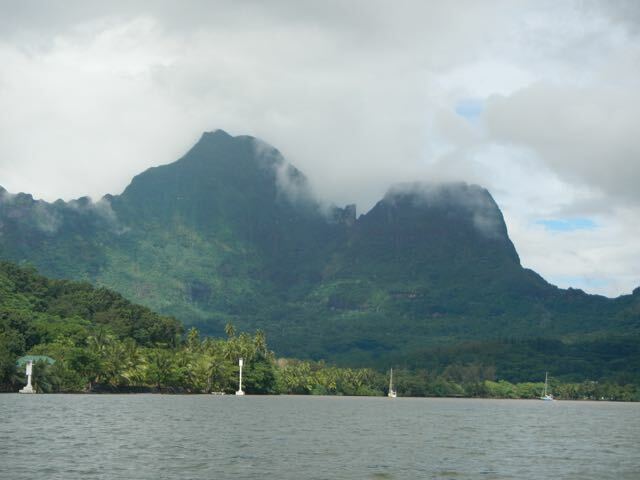 For my vote, Moorea is more beautiful than Bora Bora. 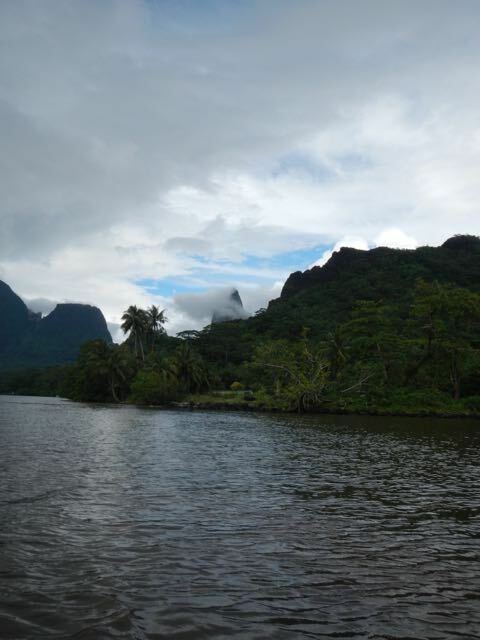 Many films were shot here because of the great beauty and rugged mountains. 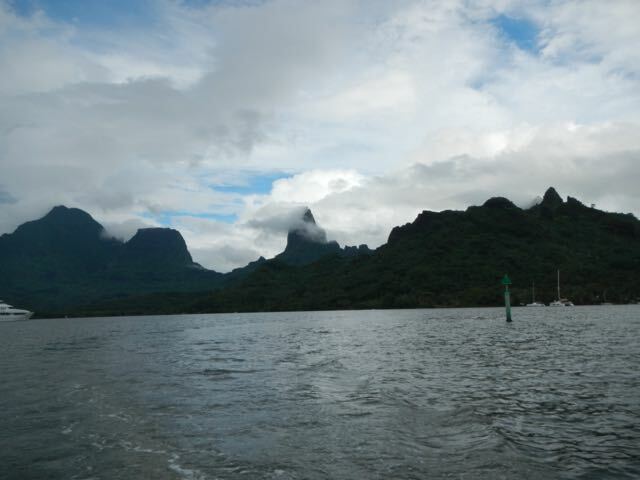 The 1984 Mutiny on the Bounty film was shot here, as was a lot of the movie South Pacific, among others. MV Dragonfly seems a bit out of place here, but she is a big beautiful vessel, anyway. She's Australian, by her red flag. The web entry for her shows her to be 240-feet long and 33-feet wide, and a 27 kt speed. 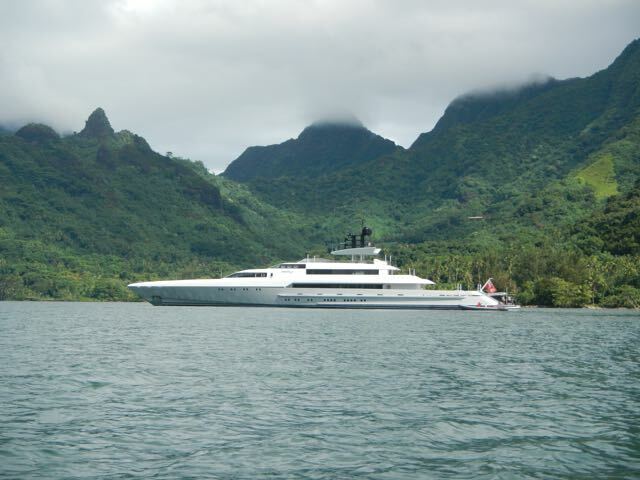 She's for charter if you're interested. This is Robinson Cove, in the far end of Opunohu Bay. Big mountains back there, aren't they? 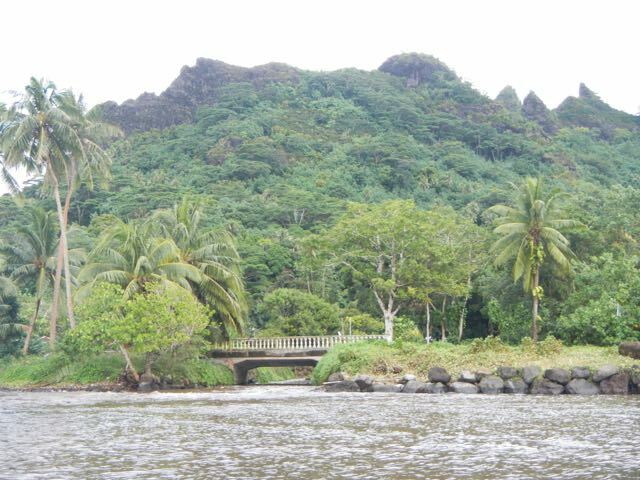 I shot this photo of this typical and beautiful French Polynesian bridge. We've seen them all over the country. They're concrete but with these lovely molded ballustrades. The river was turning the immediate water an opaque brick-red. Another view of Opunohu Bay from the East side. 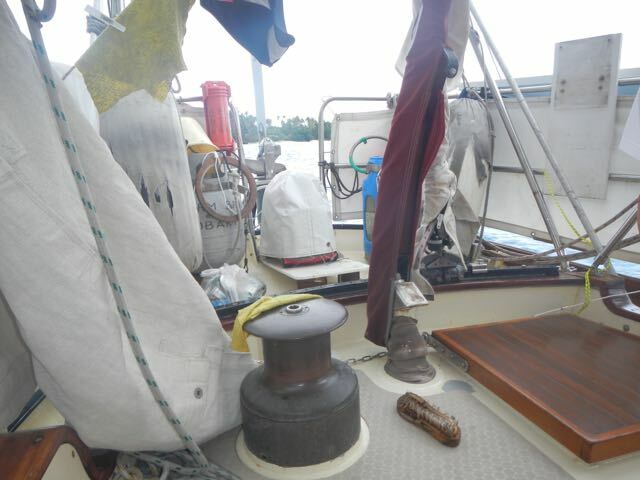 We also reacquainted ourselves with more Mexico friends aboard Calypso, a Bob Perry designed Hans Christian. She's very "salty" looking with those exterior chain plates, isn't she? The beautiful spire finally appeared out of the clouds just as we were headed back to the boat. What a rough skyline! 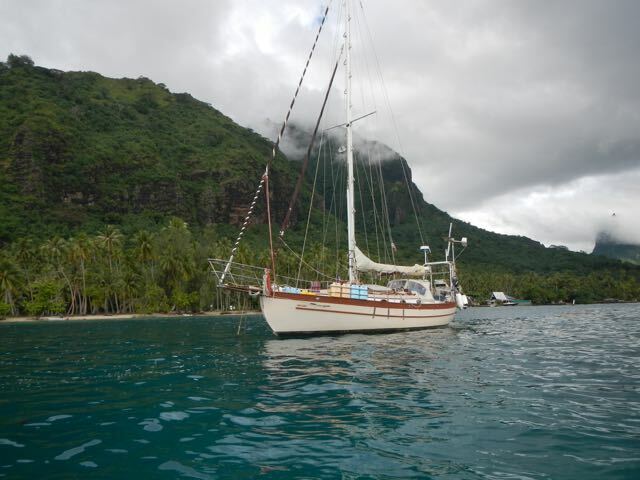 Beautiful Wings lies to her anchor in Opunohu Bay. Not entirely staged, but the Hinano was placed there! 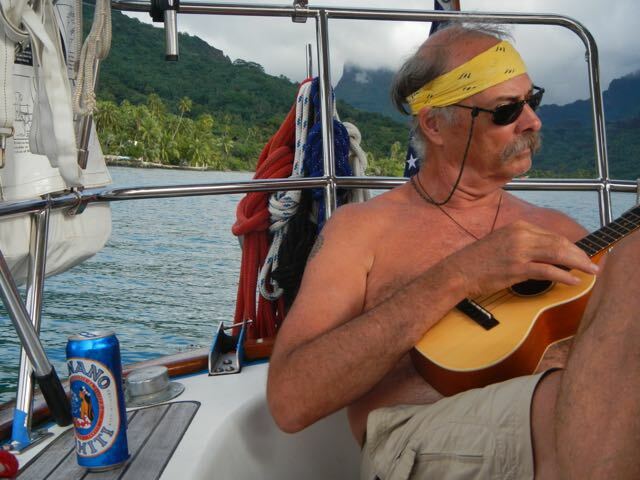 Here's Bill, patiently strumming his uke. One day, you'll recognize a tune!